EASY BREEZY LUXURY RESORT-style living at its best! 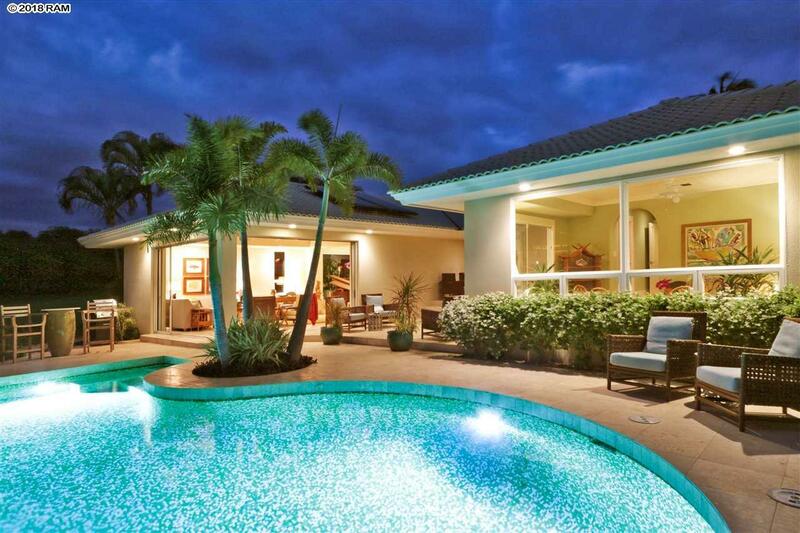 MUST SEE and Exceptional Value in Wailea's luxury market. Click on VIRTUAL TOUR link to view the lush natural surroundings! Be at one with the seamless indoor/outdoor personality of this this well-thought out home designed for those seeking casual Maui living and entertaining . From the moment you open the privacy gates into the courtyard, you will feel an immediate sense of relaxation with its open-air design that filters in abundant light and fresh tropical breezes. Tastefully renovated (in 2014) throughout, this approx 2, 100 sqft, 3bd/2.5ba + Bonus Room, open floor-plan and mostly single-level home (few steps down to living and pool areas) offers the modern conveniences found in newly built homes. Delight in its many fine features: Travertine floors throughout home from entry to pool deck, central AC/vac (upgraded 2017), gourmet chef's kitchen w/ branded appliance package including NEW SUB ZERO FRIDGE, 5-burner gas stove/deep pot water filler/walk-in-pantry/vintage farmhouse sink/ and oversized counter-top made of gorgeous Verde Kamerica granite slab from So America (you'll love the natural Maui island design imprinted in slab!). Extra bonuses: The owned PV Solar system for low-cost utility bills, separate solar heater for pool (2017), sold mostly furnished (few exclusions), quiet greenbelt location, and sparkling hand-laid iridescent mosaic tile SOLAR heated pool (re-tiled 2014)! Wailea Kialoa is one of Wailea's premier gated communities with world-class golf, shopping, top-rated spa resorts like Four Seasons and Waldorf Grand Wailea, Keawakapu/Wailea & Makena beaches, are all within minutes drive away.